Pac-Man's next adventure seems to lift a page from Scooby Doo, and not just because the game is linked to an animated series. 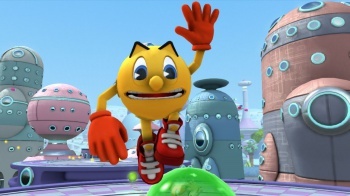 Dubbed Pac-Man And The Ghostly Adventures, the game is slated to appear on the Xbox 360, PlayStation 3 and Wii U. This would the main iteration of the title, which is a 3D game which appears to have more in common with Pac-Man's latter-day platforming adventures than his pixelated arcade roots. A 3DS incarnation of the Ghostly Adventures will also be available, but this version will be something of a 2D translation of its console analogue. The game revolves around the vibrant universe of Pac-World, where Pacworlders lived in peace until the mischievous Netherworld ghosts, led by their wicked leader Betrayus, escaped from their ghoulish domain to forcibly take control of Pac-World. Pac-World's only hope lies in the last surviving yellow Pacworlder, our hero with a voracious appetite. Like I said, that's basically the same premise used for The 13 Ghosts Of Scooby Doo, only we expect far less annoying Scrappy Doo antics, and presumably a bit of ghost-chomping. The aforementioned animated series follows this same premise and will air on the Disney XD network. Supposedly both the show and the game will debut at some point during Fall 2013, though any more specific release date info is currently unavailable. Just out of personal curiosity, how many of you are excited for this news? A new Super Mario Bros. title is always a big event, but is Pac-Man still really much of a draw for anyone? I legitimately enjoyed the characters PlayStation 2-era platformers, but so far there's been scant little to differentiate the yellow guy's more modern games from any number of other mascot-based games. I've got my fingers crossed that Ghostly Adventures is all kinds of great, but to be honest, they aren't crossed very hard.